Last Friday was the first of March and first official day of autumn according to the upside down European calendar of the seasons we use in Australia. For most of us this seasonal demarcation of the seasons from the old world is pretty useless – we still have a fair bit of hot weather to go before the cold weather hits. 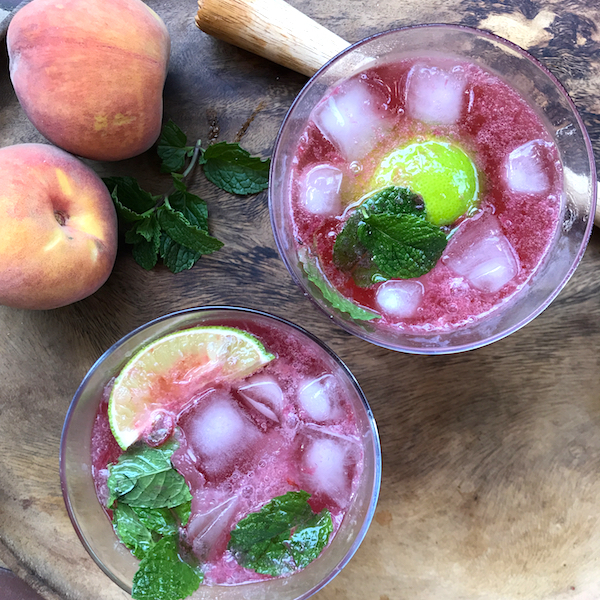 So it’s not to late, to use the last of the summer peaches, to make this cordial for a refreshing drink for those heat waves that are still to come. I made this cordial a couple of a few weeks ago, on a super hot weekend and it was my first preserving of the summer’s bounty for 2019. Then despite the unseemly heat I followed up by making a double batch of pomegranate syrup. If you come across an excess of pomegranates I highly recommend making some of this syrup, it’s now a must have in my pantry. I use it to dress salads, throw it on vegetables when I roast them, put it dal or chickpea stews or use it a dash of it to flavor a glass of iced tea. This is the first year I’ve made this cordial, but it won’t be the last and I won’t wait until the end of summer next time. This is a very lightly sweetened cordial made by steeping the fruit for a couple of hours in boiled water. It’s like an extract of peach and raspberries, light, slightly tart and incredibly refreshing. It’s excellent for spritzers, iced tea, drizzled over yogurt for breakfast or vanilla ice-cream as a kind of instant peach Melba desert. Place water and vanilla pod in a large saucepan over a high flame. Bring to the boil and turn down to a simmer for 10 minutes. Remove *vanilla bean. Bring vanilla water back to the boil. Remove from heat and add peaches, raspberries and lemon rinds. The vanilla water should just cover fruit, otherwise top up with some boiling water. Leave fruit to steep in the water until cool (At least 2 hours) Then drain out the fruit through a sieve. Don’t press the fruit against the sieve just the let the liquid flow out naturally. Whisk in sugar and lemon juice to taste. This cordial should be very peachy and slightly tart. You can eat the drained fruit with yogurt for breakfast but the steeping process has drained it of most of its flavor.